I replied her in my chat box, and I would like to elaborate here. Hope Eve will get her doubts cleared with additional information loaded. 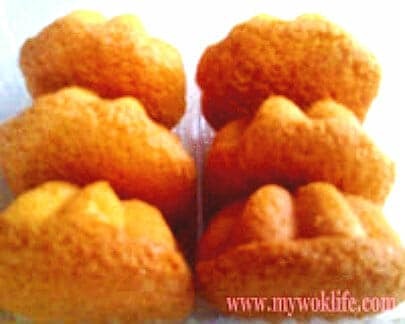 As mentioned in my chat box, egg cake (Malay term as “Kueh Bahulu”) is not fattening, but its high sugar content makes it a ‘diet killer’. Egg cake is not something nutritious as it simply made by egg, flour and loads of sugar! However, it is so tasty to have it once in a while. I will suggest one to take it as snack/ tea instead of breakfast as you need much more nutrients than this as breakfast food indeed. Steamed carrot cake, this local carrot cake is not the sweet carrot cake which we eat at Coffee house. It’s the Chinese-style radish cake pieces we are talking about here. This Steamed Chinese carrot cake (Chinese translation: “Luobo Gao” 蘿蔔糕) uses excessive oil to make this dish, be it steam or fried. Steamed Chinese carrot cake always add with dried Chinese sausage cubes (Chinese translation: “Lap Cheong” 蜡肠) which makes the carrot cake more oily and perceived as unhealthy. However, carrot cake is high in Vitamin A. Most of us have carrot cake as breakfast or morning tea break, and it’s easily available at most Chinese Dim Sum Restaurants. Just bear in mind that eating carrot cake moderately should be OK, but not a ‘daily affair thing’. A big piece of steamed carrot cake counts about 350kcal. Popiah (Chinese translation: “Bao Bing” 薄饼) aka Hokkien-style fresh spring roll, my favourite side dish during dinner, soft and juicy roll! Turnip (Local term as “Meng Guang” 沙葛) as its main filling ingredient wrapped with a paper-like thin crepe. This grated turnip is cooked using stewing method. Turnip absorbs oil easily. Hence, it can be quite oily if excessive used in stewing, thereafter, soaked in gravy to keep its moist. Eating a piece of Popiah filled with stewed turnip, dried Chinese sausage cubes, egg pieces, fried shallots, bean sprout, and some crunchy fried flour pieces, counts about 180 kcal. If you are eating the fried version, please expect about 300 kcal per piece as it absorbs oil easily. Other local food such as curry laksa, fried kuey teow, Hainanese chicken rice and etc, are pretty high in calories (easily about 500 – 600 kcal per regular portion). It has to be sad to say, it’s quite fattening lor (laughing)!! Do watch out your calories intake here! Hey! No worries, eat more and exercise more, just like I do! Just kidding though… Eat moderately, and exercise regularly, are the main key of healthy and balance diet. A simple exercise that you may not hesitate to do it everyday. kueh baulu is like my favourite snack! Doesnt help that there is this shop that I pass by almost everyday and displays the kuehs right out in my face. so accessible too! Actually I don’t really a fan of kueh bahulu.. but my girl loves it!